Some of these activation goals may seem silly, while others seem relevant, but your particular goals will depend entirely upon your product. If your product is a blog that makes money from advertising then you may want to focus on numbers 1, 3, 4, or 5. If you have an email address then you can message them in the future about new articles. If they read what is already on your site they will see the quality of your journalism and want to read more. If they comment on an article then they will be more apt to come back, especially if others respond to them. If they share your article on Twitter then it will get you more readers. All of these goals lead to eyeballs that will make you more money with advertisers. A different product will have completely different goals. It is also important to recognize that the fewer goals you have, the more likely you are to achieve them. If you have 5 activation goals then it’s difficult to use the tactics in this chapter to achieve any of them effectively. At a minimum, for a given section of your product you should have one primary activation goal. If someone comes to a landing page from a specific campaign then this means that you can hide many of the navigational elements, since this will just distract people from completing the goal you have decided on. They’ve already shown interest by being on a landing page in the first place, so you can focus their attention. A landing page only needs one call to action for the same reason that you don’t need many navigational elements. If you give them options then you will lose them, and no one can end up on a landing page unless they came through a specific campaign, which means they are ripe for activation. Since you know the source of a person that ends up on a particular landing page then you can tailor the experience for them. You should use language which will appeal to them, even if it doesn’t appeal to your visitors at large. The language, and even imagery, of your landing page should be congruous with their expectations based on the source they came from. Before you actually launch is one of the best times to get traffic. You can tell people that they will be let into your product first if they share your launch page with others, or you can only let them sign up on your beta list if they tweet about you first. Get creative. Since you haven’t launched yet you probably won’t have much detail to add to the launch page. This means that the headline and subhead become very important. If those few words don’t get someone’s attention then they will bounce. Besides the headline and subhead, you also need a very emotional image. A fullscreen background image is the common practice. Make them feel emotion, despite your lack of content. As you build a list of people that are interested in the launch of your product you must not let the list get cold. If you don’t email them for months, then suddenly tell them about your launch, your click through rate will be very low. Stay in touch with them through the process of building your product to keep them warm, or don’t even take email addresses until you are within a month (or less) of launch. If you are trying to create landing pages quickly then you can use a service like unbounce.com, and if you are creating a launch page then you can use a service like Launchrock. Why is your product unique? What do you do that competitors don’t do, or can’t do. If you don’t tell people that you’re unique then visitors will assume you’re not. The subhead is smaller text below your headline that further illustrates your unique value. It might give reasons why the headline is true. Use this to take away doubts or clarify the headline. If you are selling something that costs $500 then you need lengthier copywriting. This will give you a chance to inform, answer objections, and just generally convince them to become activated members. If you are selling something for $20 then long copywriting will bring up more objections than it answers. It will confuse people more than it helps people. For low cost products, short, precise, copy is better. Don’t just imitate someone else’s copywriting style. Your words need to fit your audience. You should use jargon if you’re talking to doctors, but not if you’re talking to laymen. You can use slang if you’re targeting kids, but not if your audience is filled with grandmothers. 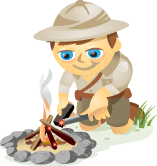 By researching your audience online (message boards, surveys, etc.) you will start to see which words they already use. If you use their own words in your copywriting then you’ll be able to activate them much easier. It would be wise to use testimonials within your product because humans behave with a herd mentality. If everyone else is doing something then so will I. Social proof is a form of copywriting that will help you activate visitors. Microcopy is the short tooltips, hover boxes, or other text that helps a visitor navigate the interface. Little clues, at the right place, can help people navigate your UI. Confused visitors don’t usually do what you want. We’ve already mentioned it a few times, but calls to action deserve their own section. The best way to get someone to do what you want is by giving them a clear call to action. Leave nothing to their imagination. Tell them where to click and make the button obvious. Tell them who to call and make the phone number prominent. Activate visitors by telling people, in the most explicit way you can, what you want them to do. Below are some examples of great call to actions. When people arrive on your site it’s like they’ve been dumped in the middle of New York City without a map and no sense of direction. Your job is to give them orientation, and lead them to the places where you want them to go. One of the best ways to guide visitors is through onboarding. Onboarding can take the form of visual directions placed on top the screen, or a series of pages that lead visitors from one place to another. Think of onboarding like a digital tour guide for your product. An explanatory video could even be a part of your onboarding strategy. Twitter has one of the most talked about onboarding experiences because they carefully guide people from creating an account to using an account, and it’s all through the onboarding. They know that an account that doesn’t follow anyone is kind of useless, so they make following others a part of the signup process. Another great example of onboarding is InVision. They give you large, obvious, pop ups throughout their product that guide you and tell you what you need to know. People are not patient, and they don’t care about your product enough to find out how to use it. If you want to activate visitors, making them take certain actions, then you must carefully craft your onboarding experience. It is common within products to tell people that their profile is only a certain percentage complete. This prompts us to get to 100% because we hate not finishing something. Just by adding a progress bar with a percentage then we have gamified our product. We are all still in little league baseball. Trophies matter, even if they are meaningless. If you can award something within your product then you will create a gamified incentive for people to take certain actions. Just think about Foursquare. It’s one big baseball game for adults with mayorships and badges instead of cheap trophies. Just by showing someone their rank you can prompt them to compete. If you let someone know that they are in 3rd place for most comments on your message board there is a good chance they’ll take actions to get in 2nd place. Leaderboards can activate people to take certain actions. There are countless ways to gamify your product, but you have to think about your product as a game (even if it is a B2B app). Getting someone to make a purchase is really just a unique kind of activation. You are getting a visitor to take a certain action, that action just happens to be making a purchase. There are a number of best practices around activating people to make a purchase. They may not all apply to your situation, but some of them probably will. Pricing is an important aspect of activating people to make a purchase. There is something called perfect price discrimination which is the act of creating a pricing structure that charges based on the consumer’s purchasing power. Ecquire does this well by making their lowest tier only support basic integrations. This is everything except Salesforce. They know if you are using Salesforce then you can afford to pay for an expensive plan. Another popular strategy to activate purchases is to have three pricing tiers. Just the fact that there is a more expensive option makes you feel like you’re not wasting money, and you are getting a good deal. Having a pricing tier below you can make you feel like you’re not a cheap person. Options give people confidence to buy. If you name your pricing tiers something vague like gold, silver, and bronze, then you don’t really help people discover which tier is good for them. By naming the tiers things like “Starter,” “Professional,” or “Team,” you are giving people the confidence that they are in the correct tier. People are afraid to make an irreversible mistake with their money. If you give them a money back guarantee, or a free trial of some kind, then you are taking the risk away from them and placing it on yourself. One of the most powerful forces, in terms of getting someone to make a purchase, is a discount code. But there is a trick that makes discount codes even more effective. If you include a time limit on the discount then you force people to make a decision. Udemy is a great example of this kind of activation tactic. They send out emails on a regular basis which include discount codes that are only valid for a limited time. Another way to get people to make a purchase is through bundling your product with other products. If you can overwhelm people with value then they are more willing to make a buying decision. Hacker Bundle is a good example of a service that uses this activation tactic. The post The Right Way To Use LinkedIn For Marketing appeared first on Social Media Explorer. As a brand, an influencer, or just someone who has something to sell, you need to think your social media strategies from the ground up year after year. That may feel a bit tedious, so you may want to learn about some strategies that tend to remain relevant, even in the ever-changing landscape of social media. The millennial generation is all about having a voice and be heard, and generation Z has grown – and continues to grow – surrounded by the digital environment that has been in the works for the last decades. Therefore, you must identify your audience clearly and cater to its needs. Especially if your audience falls into these age groups, you must prove that your love for the people who watch you, read you, or follow you, is the genuine article. Millennial and Gen Z groups can’t be fooled with clickbait content. Traditional ads that exaggerate the benefits of a product or a service are today the stuff that memes are made of. As a result, these consumers value honesty above all else, and, in that respect, they are no different from other age groups. Only that they are better equipped to be able to tell when a company or an individual is trying to sell them something they don’t need or want. So, be honest and genuine, and your follower or subscriber base will grow. One of the things companies, brands, and influencers have complained about over the years is that social media doesn’t entirely pay off since the campaigns they run don’t yield the expected results. When building your marketing strategy for social media, always keep in mind the S.M.A.R.T. formula. In other words, your approach must be specific, measurable, attainable, relevant, and time-bound. There is also something that should be added here. You should set realistic expectations. Work on small samples of consumers, and start small. This will give you the possibility to adjust your marketing strategy as you go, without investing the entire budget for the year. Building a brand new strategy can be challenging and time-consuming, especially for someone who doesn’t have the resources of a big corporation at his or her disposal. So, one thing you can do is to start examining what your competition does. There is no shame in imitating something that works. As long as it fits your business model, you should give it a try and see the outcome. The mantra of the last decade has been this so far: content is king. And it should be so since people seek real value even when they are just browsing through their social media feeds. For them, well-written reviews of products that come from established experts, as well as consumers just like them, represent the real value. That is what you focus on, too. Provide real value with each blog post you write, YouTube video you create, or photos you want to post on Instagram. Consumers are no longer passive spectators to ads, presentations, and other marketing materials brought in front of their eyes. They like to comment, share their opinions, express their doubts, and that’s the type of resource that you shouldn’t overlook. If someone says something, good or bad, about your product or service, answer in a timely fashion. If you have to deal with an influx of such input, maybe a good idea would be to hire someone to be in charge of engaging with your audience. The post Social Media Strategies That Are Still Relevant appeared first on Social Media Explorer. In the world we live in today, social media is perhaps the best way businesses can interact, and build relationships with their target audience. The direct interaction it offers allows companies to develop their personalities and present them to their customers. It’s no surprise that a whopping 92 percent of small business owners who are social media users consider it a crucial strategy. It helps potential customers recognize your brand, build a community comprising your followers, and helps foster your bottom line. With the number of social media users increasing by the minute, it has become increasingly important for every business to incorporate social media into their marketing strategies. Similar to how you focus on search engine optimization (SEO) for your website, the same rules also apply to your social media profiles. For starters, you can ensure that your biography and about description have keywords incorporated to them. Furthermore, make sure you haven’t missed out any section in your profile and that all relevant information has been completed. You should also include your website’s link to your social media biography since this is a great way to boost your website’s SEO. By using your social media profiles to link back to your website, you can create high-quality backlinks which are especially useful to social media profile optimization. There’s absolutely no point posting content on your social media profiles if the audience you’re targeting isn’t online to see it. Of course, this doesn’t mean you won’t get any views at all. However, it’s likely those aren’t the views that fruitions into action and they may contribute to your bounce rate. The solution to these problems is the peak time, which is simply the time most of your target audience is active. The peak time often varies on different days of the week with Thursday being popular on Twitter (5 pm) and Facebook (8 pm) and Friday is the most popular day on Instagram (7 pm). Once you’ve established your brand, you can start experimenting with different times and days to see how your audience reacts and whether the experimentation drives enough engagements. With a few trial campaigns, you can analyze the results and determine what works best for your brand. While this tip is pretty much a given, there’s no downplaying the importance of sharing your posts to your social media profiles. Every time you publish a new blog post or upload a new photo on Instagram, you need to ensure your social media audience also knows about your new content. Blog posts, in particular, will be able to draw in more audience when they’re shared on social media since, when more people gain awareness and access to your content, it boosts your search engine optimization (SEO) and helps with engagement. Just like anything else, it’s important to analyze your results and determine what works for you. For instance, it’s possible you’re gaining more traction on platforms, such as Facebook and Instagram, than Twitter or LinkedIn. Using a tracking tool allows you to see where most of the traffic was coming from and how that traffic interacts with your content. The best way to figure where you should start and what your business is supposed to do is by looking at what’s working for your competitors and taking that up to a notch. Once you’ve determined what tone or voice works for your social media posts, you can use other skills, such as Photoshop and photography, to come up with better content and even use them to post product images for your e-commerce business. There are various content generation tools, such as Canva, available that will help you come up with new and original content and gain more followers. Content with visual elements, in particular, such as images, gifs, and videos, will tend to get more clicks, views, and share than any other kind of content. Additionally, your content should also be accompanied by short text or description, hashtags, and emoticons to encourage more interaction with followers. For instance, you can post images, quotes, links, or reshare something altogether. You should keep the tone and theme of your content consistent to avoid creating too much disparity in your brand personality. Before you jump right in and start implementing your devised social media strategy, you need to step back and reflect on one crucial aspect: know your audience. Every social media platform caters to a different audience, and you need to choose one that falls in line, not only with your target audience but also with your business goals. For starters, you should focus on the demographics of your target audience to draft up your target buyer personas and the mediums they prefer. You don’t need to be active on all social media platforms; you need to choose the ones your audience is active on. For instance, Twitter is excellent for political organizations while Instagram is perfect for food and travel bloggers. Keep in mind that you’re aware of the rules and guidelines associated with the platform you choose. For instance, if something such as your Instagram story dimensions could turn off your potential followers and push them the other way. Using social media to boost your website traffic is an excellent way to create brand recognition. By starting with at least one of these top-notch tips, soon enough you’ll be drawing more and more visitors and establish you’re it enough even to sell your website one day. Regardless of what route you decide to take, social media is a valuable asset to add to your arsenal, and the possibilities it offers in terms of content marketing and lead generation are endless. Have you tried any of these tips before? Or do you have suggestions of your own? Sound off in the comments below! The post Five Tips On How You Can Use Social Media To Boost Website Traffic appeared first on Social Media Explorer. Social media can be seen as an information hub as you can find all sorts of news, trends, and gossip on the many platforms. In light of this, business, organizations, and brands often want to both create a presence online and ensure they’re up to date with what’s going on in their respective industries and beyond. The health industry especially is a good place where you can find useful information that will help you learn more about health whether for personal or professional reasons. Here are a few health trends that you may be able to identify via social media if that’s your aim. If you haven’t already noticed, fitness happens to be trending on social media at the moment. If you check for popular health-related hashtags, you’ll find that millions of people are sharing health-related content. In addition to this, social media is influencing the way people exercise as now there are videos, live streams, as well as a community of people encouraging and rooting for one another. Aside from the mentioned, another health trend that you have likely been able to identify on social media is mindfulness. As there has been much more talk about mental health and the need to improve wellbeing, there is no surprise that mindfulness is on the radar too. You will find many professionals promoting mindfulness teacher training if that’s something that interests you. Being more mindful and taking the time out to reflect can make your days and health far better. Thanks to graphics and infographics, people can now learn a lot more about health by merely scrolling through their galleries. This can be seen as a great thing as it’s a way of getting more people to evaluate their lifestyles as well as pay more attention to their health and that of those around them. There is even the opportunity to learn more about the health of your pets if you happen to have any. Dog skin cancer, for instance, is something that could be detected early on by simply following a dog brand or vets on social media. Awareness posts go a long way in creating reminders and teaching you new things. In addition to awareness, there is a lot more healthy food content trending on social media these days too. You will probably notice that there are colorful dishes as well as organic and plant-based foods trending because of their supposed health benefits. Not only can you get dish inspiration from such pages, but it’s also the chance to learn about different products and their health benefits. You’ll usually fund nutritionists, healthcare professionals and brands sharing such content. Social media trends happen daily in every industry. Whether you happen to be a health fanatic or just want to learn more about your health, you’ll find the kind of information you need. It provides opportunities for people in the health industry to promote their services as well as share their knowledge. The post Identifying Health Trends via Social Media appeared first on Social Media Explorer. These days, social media is an incredibly powerful tool that can be used in both business and your personal life. Not only is it a way to connect you to people all over the world, but it also helps to share information much faster than traditional mediums like news stations or radio. Having said that, if you’re an entrepreneur or business owner, social media is a tool that you should be using to grow your brand. It is multi-functional and can help you meet several goals or objectives. On that note, continue reading to learn more about ways you could be using social media to leverage your business. One of the primary ways that social media can be used to leverage your business would be to create brand awareness. There are a few ways to help you achieve this, but the first would be to find your target audience where they are. It will require that you do research and figure out what platform they’re likely to be on. You can then create content that they’re most likely to engage with. In doing so, you have a better chance of creating awareness about your brand, and hopefully building your business. Another way that social media can be used to leverage your business is by using it as a platform for selling. Not all brands do this, but if you choose to, it’s crucial that you have an effective strategy in place. Below are a few things that you may decide to sell on social platforms. Property: Real estate has always been lucrative and continues to be because in most cases, property doesn’t decrease in value. In light of this, if you wanted to sell properties, social media would be a good place to advertise. Platforms like Instagram especially are visual, so you could show images of the properties that you want to sell. For example, if you were selling Calabasas real estate you could utilize Instagram stories and do a swipe-up linking to the properties website. Retail: If you haven’t already noticed, retail brands tend to do well on social media. They typically are able to showcase their products and give consumers the opportunity to buy through their website or via direct message. However, when selling products on social media, it’s crucial that you don’t forget to curate and share custom content. Selling a Business: If you happen to be in the process of selling one or more of your businesses, social media can also be a great platform for this. If, for instance, you were selling an accounting practice, you could get the word out on Twitter, Instagram or Facebook depending on where your audience is. Another way to use social media to leverage your business would be to increase engagement and build an online community. Aside from selling, social media is a great platform to help you show your customers your human side. Do so by responding to their comments, asking them questions and reminding them how your brand fits into their daily life. The post Using Social Media to Leverage Your Business appeared first on Social Media Explorer. Still, on the financial side, this is a strong set of results for the company. Going into today, average analyst expectations were for Twitter to post about $775 million in sales ($742-$815 million range) on an EPS of $0.15 per share ($0.10-$0.20 range). Twitter itself last quarter said it expected Q1 revenues to be between just $715 million and $775 million, with operating income between $5 million and $35 million. Shares are up 6.22 percent so far in pre-market trading. With those numbers relatively stabilised, Twitter is putting more focus on trying to improve its actual product in the two areas where it has been considered weak: the ability for people to use Twitter when it gets noisy and active; and the general “health” of content management, around harassment and fake news. The “initial focus” of the twttr app up to now has been to focus on conversations and how to make them easier to follow. This implies that the app could stay around for some time to come and become the testing ground for much more, including Twitter’s increasing forays into video and other content and how it manages bad actors on the platform: in other words, aspects of the service potentially represent opportunities for growth and monetization — or otherwise urgently need attention because if they don’t get resolved they will ultimately hinder both. This is the last quarter that Twitter is reporting monthly active users, as it makes a switch instead to reporting “mDAUs”, or monetizeable daily active users, which it claims is a more accurate representation of how the business is growing. MAUs have not been a great metric for the company over the years, with one of Twitter’s strongest criticisms being that its user growth is stagnating. Given that the platform has a strong surge of usage around specific events, the average usage on days will work out stronger than that of usage on a monthly period. As is the case with Facebook, a majority of Twitter’s users (but not revenues, see below) are coming from outside its home country of the US, where mDAUs were 28 million, compared to mDAUs of 105 million internationally. Last quarter, while reporting a relatively strong set of Q4 earnings, we noted that Twitter’s stock dropped on that weak guidance, which represented a big drop from Q4 at a time (Q1) when many expect Twitter to report its strongest numbers. As a point of comparison, a year ago in Q1 2018, Twitter posted revenues of $665 million, on an EPS of $0.16 per share, both blowing past Wall Street estimates with sales up 21 percent year-on-year. Drilling down into where money is coming from for the company, the US is still Twitter’s biggest market in terms of revenues, if not users. The US accounted for $432 million, or 55 percent, of Twitter’s revenues, with international revenues at $355 million. To note, Twitter noted that the US is current the engine of its revenue growth, where figures were up 25 percent on last year (while international was only up 11 percent). Japan, it noted, continued to represent Twitter’s second-largest market, contributing $136 million to Q1 revenues. In terms of what is actually making money for the company, advertising continues to be Twitter’s biggest cash cow. Of its $787 million in Q1 revenues, $679 million, or just over 86 percent, comes from advertising. That’s been a consistent proportion: ad revenues were up 18 percent, just like overall revenues. As with other social platforms, video is giving advertising a boost at Twitter. It specifically singled out Video Website Cards and in-stream pre-roll ads. Data licensing and unspecified “other revenue” was $107 million, up 20 percent, and it sounds like Twitter isn’t expecting huge growth in this area. “DES continues to see new customer opportunities and use cases as well as smaller customers adopting our self-service APIs… however, we are now largely through our multiyear enterprise renewal cycle in DES. As a result, many of our largest partners are now at market pricing and data licensing revenue growth is likely to moderate for the full year,” it noted. More to come from the call. There’s a misconception floating around that you should share as much content as possible on social media. However, the reality of the situation is that not all content is well optimized for social media platforms. And if a certain piece of content is optimized for one social networking platform, it may not be conducive to another. Sticky content is essentially content that you publish on your website with the intent of getting users to engage with your brand and spend more time on your site. It’s content that adds value to the reader and commands a response. Sticky content also happens to be shareworthy – meaning that it excels on social media platforms and encourages people to click. Sticky content should not be confused with clickbait, which uses spammy and misleading tactics to encourage website traffic. There’s actual value and the exchange between the brand and user is mutually beneficial. Facebook has 2 billion monthly active users and has almost a perfect split between males and females. It also skews heavily toward the older age ranges, with 72 percent of all internet users over the age of 50 using the platform. Instagram has 800 million monthly active users and skews heavily female (just 42 percent of users are male). The age distribution is also much younger with teenagers and millenials accounting for the majority of users. Twitter has 317 million monthly active users – 53 percent of which are males. Just 21 percent of internet users over the age of 50 use the platform. Twitter, like Instagram, tilts younger. A piece of content that does well on Facebook probably won’t do as well on Twitter. Not only are the audiences different, but so are the expectations and the delivery. Keep this in mind and create sticky content with specific platforms in focus. Content that’s predominantly textual in nature won’t perform as well as content that has visual elements. If you’re going to share a traditional blog post on social media, be sure to incorporate visual elements into the post. Not only does this make the page itself more digestible, but it also gives you a magnetic element to push out when you post the content on Facebook, Twitter, or whatever platform you’re using to share it. This page from Henry C. Dailey Law Firm is a good example. Notice how the content uses different graphics to summarize the contents of the article. These graphics can then be used when sharing on social media. As a result, people will be more likely to click. People get tired of reading the same old content on the same recycled ideas. Sticky content should be fresh and unique. The popular article from Seth Adam Smith, titled Marriage Isn’t For You, is a fantastic example. It’s merely an article on how to have a better marriage, but the polarizing headline garnered the post nearly 2 million shares. People don’t want to sit in front of a screen and read thousands of words until their eyes glaze over. They’d much rather engage with the content. Social media is too valuable of a marketing channel to keep getting it all wrong. It’s not about posting as much content as you can muster. Instead, it’s about maximizing the quality of the content that you do post. Three or four quality posts each week will yield far more value than 15 or 20 weekly posts that don’t connect with your followers. The post How to Create Sticky Content to Share on Social Media appeared first on Social Media Explorer. 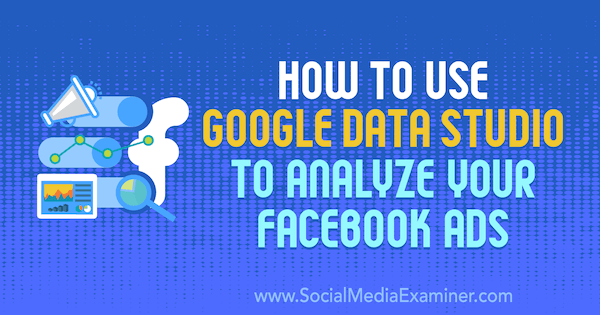 Social media marketers can create visualizations of data from Facebook Ads Manager and Google Analytics. 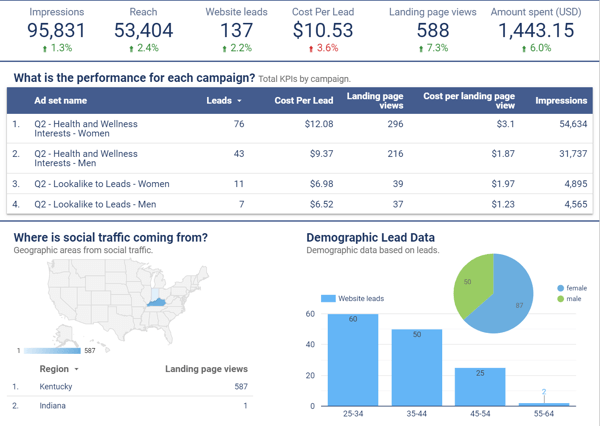 From basic reporting tables to more advanced charts, marketers can better track and analyze Facebook advertising campaign performance by using Data Studio. Data sources power charts created in Data Studio. 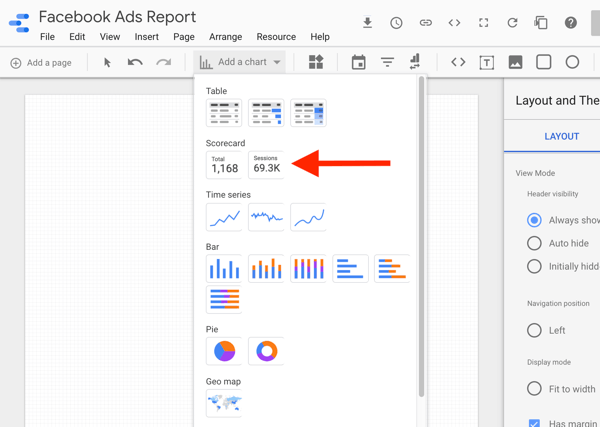 A data source will connect the information from Facebook Ads Manager, Google Analytics, and other marketing platforms to Data Studio so that you can create charts within a reporting dashboard. To create a data source, you’ll pull in information from Facebook Ads Manager and Google Analytics using a connector for these platforms. 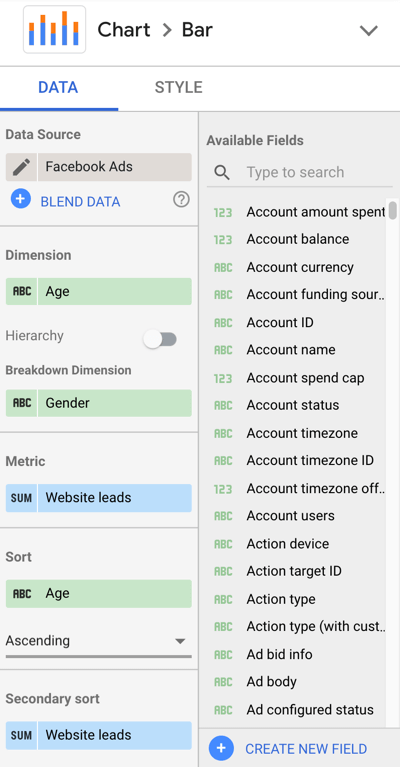 Google Analytics is a native connector in Data Studio, so you don’t need any other integration to bring this data into your report. For Facebook Ads Manager, you can use a partner connector. Supermetrics is a popular option for integrations with Facebook Ads Manager, Facebook Insights, Instagram Insights, and others. This will be the simplest data source you create. 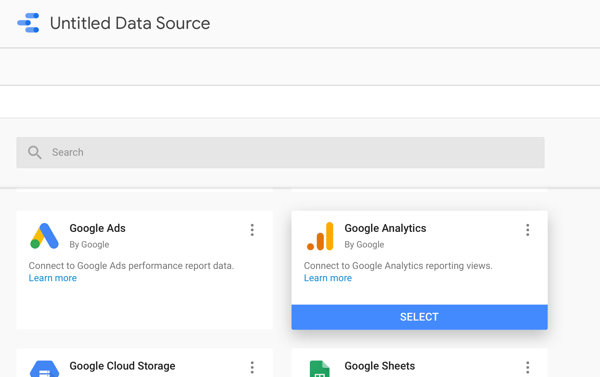 Go to the Google Data Studio data sources page. Then click the blue circle with a “+” sign to create a new data source. Next, you’ll see your choices for connectors. You can scroll to or search for Google Analytics and select it. Search for the name of your Google Analytics account and select the property and view of the data you want to analyze within your dashboard. Click Connect. Next, the data source should automatically update to the name of the view you selected. If you want to rename it, click into the name of the data source in the top left. To create a Facebook Ads data source, follow a similar process to creating your Google Analytics data source. You’ll need to use a partner connector to pull data from Ads Manager into Data Studio. Supermetrics offers a 14-day free trial to test the service’s full capabilities. It also offers a free version that allows you to pull the last 10 days of data, and low-cost paid plans starting at $19 per month. To create a Facebook Ads Manager data source using Supermetrics, return to the data sources main page and click the blue Add button again. 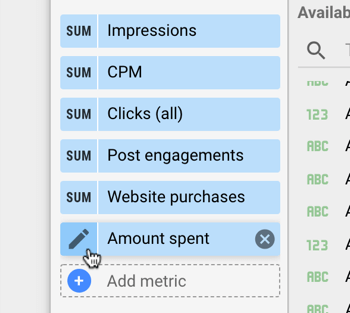 Search for or find the Facebook Ads connector from Supermetrics and select it. When creating a Facebook Ads Manager data source for the first time, you’ll need to log into your Facebook account. Supermetrics prompts you to do this with “To add more/manage Facebook Ads user accounts, visit” and provides the link to add your Facebook account. Next, you’ll select your ad account from the drop-down menu. Make sure to match the conversion window settings to the attribution window settings in your ad account, as well as the reporting time zone. To report on conversions directly through Facebook Ads Manager, you’ll need to set up standard event tracking with the Facebook pixel. Finally, rename the data source to match the name of your ad account or business. Start with a blank report in Data Studio. 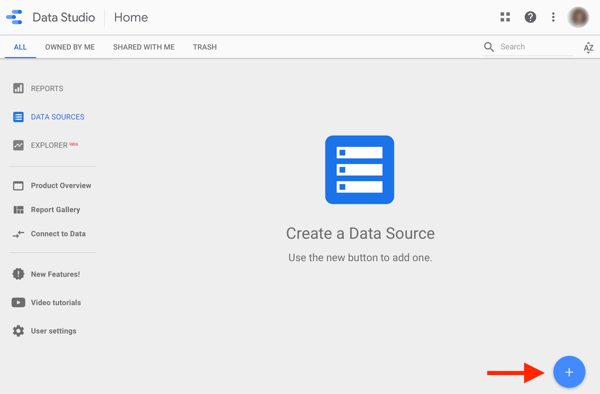 Go to the Data Studio home page and click the blank template in the top left. 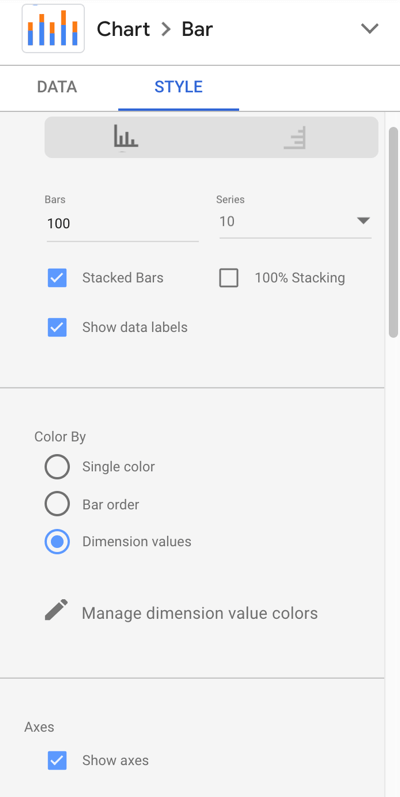 Data Studio will create a new report, which you can rename in the top left. Next, you want to add your data sources for Facebook Ads to your report. Go to the right-hand column and select your Facebook Ads data source. You’ll add the Google Analytics data source later. 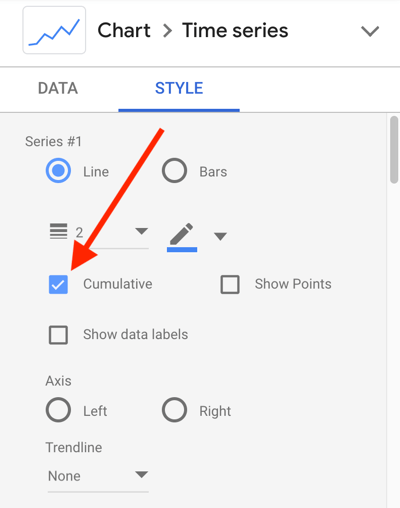 To create a chart, click Add a Chart in the navigation bar. Data Studio will provide the options for the type of chart to add to your report. The simplest chart is a scorecard, so it’s a great place to start for your first try. Select Scorecard from the options, and Data Studio will create it automatically. Each chart includes settings for both Data and Style, which can be seen in the right-hand column when a data source is selected in the report. To look at the settings you’ll explore with each chart, update the scorecard to a table. 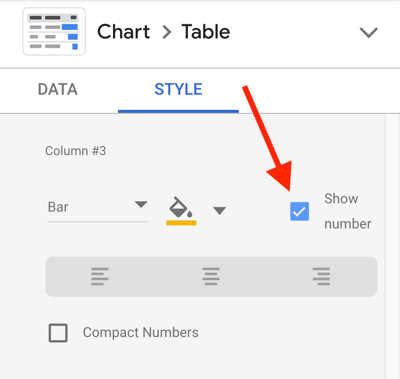 Go to the Chart settings right above the Data and Style settings and select the Table Chart option from the drop-down list. 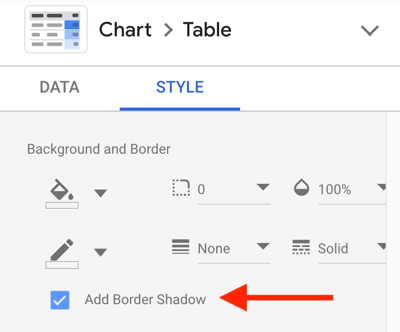 You can customize the size, color, and appearance of chart elements in your Style settings. For instance, you may want to customize your charts to match your company branding, or add drop shadows or backgrounds to charts. 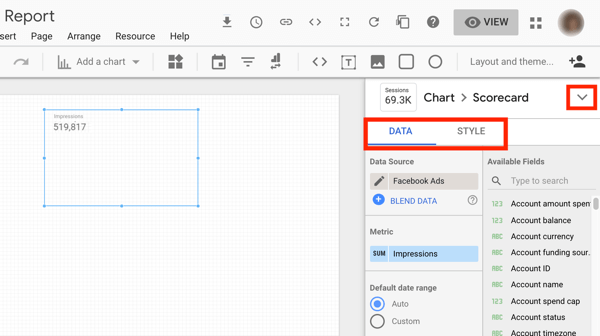 Now that you have a foundational understanding of creating and customizing charts in Data Studio, let’s explore seven different charts you can create to analyze your Facebook ad performance. 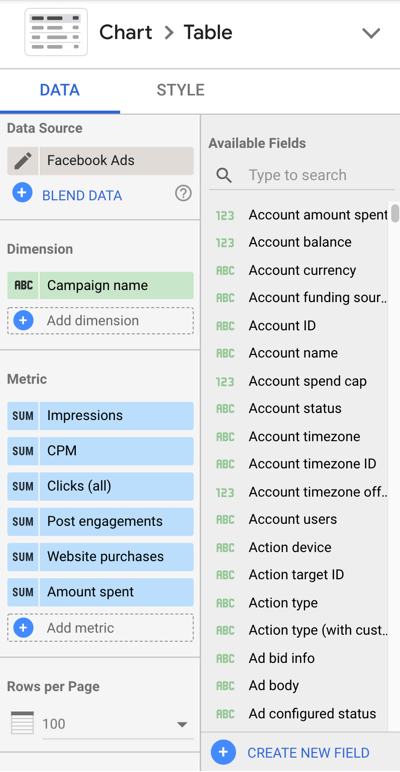 Create a table that shows all of your ad account data to get a holistic view of your Facebook ad performance. Keep metrics high-level if you’re including campaigns with multiple objectives. This table is similar to the information you would see in Facebook Ads Manager. Use this chart to analyze overall performance for a specified date range. For any metrics that are currency, update the settings of the metrics to US Dollars. Hover over the metric you want to update and click the pencil edit button. 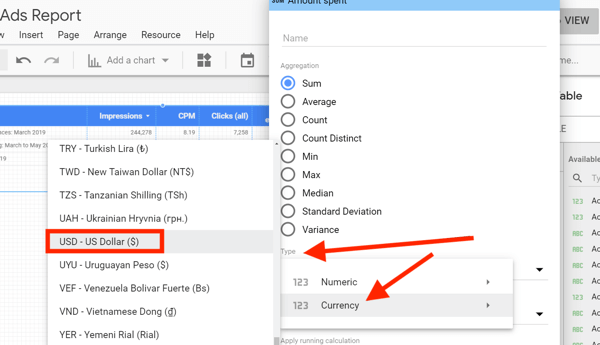 Then click into Type, select Currency, and find the currency that matches your data. Select Wrap Text under Table Header to make sure none of your table headers are cut off. If any of your metrics show as null, update the selection under Missing Data to Show “0”. If you’d like to analyze these results in comparison to a previous time period, update the comparison date range in the Data settings. Under the Style settings, you can choose which metrics you want to see the comparison data for. In the example below, impressions, clicks, and post engagement don’t include comparison data. Use a chart with comparison data to analyze overall performance for a specified date range compared to another specified date range. This table is very similar to the overall performance data; however, it differs because it focuses solely on one objective and includes a heatmap to visually categorize data with color. To visualize this, use a filter to show only conversion campaigns and report on purchases, cost per purchase, ROAS, and purchase conversion value for each campaign and/or ad set to see how they stack up against each other. Add this table to your report to compare campaigns against each other when they use the same objective. Also, use this table to compare ad set performance within a specific campaign. The chart above shows four ad sets within a campaign optimized for purchases. The highest metric in each column is the darkest color and the lowest number in each color is the lightest. You can see that the lookalike audience to this Facebook page’s fans drove the lowest purchases at the highest cost and had the lowest ROAS. When optimizing, you would consider turning off this ad set. You might have noticed that the table headers in the chart above look different from the metrics included in the data settings listed. Edit the name of a metric to better match what that metric represents. To illustrate, update “Website purchase conversion value” to “Revenue” to clean up the appearance of your table. To edit a metric name, hover over the metric in the Data settings and click the pencil icon that appears. Then update the metric name to a shortened or more direct name. You’ll still see the original name below the updated one for reference. To create the filter for this chart, click Add a Filter under Filter > Table filter. Create the conditions to include campaigns with the objective equal to conversions. This filter will narrow the data in your chart to only the campaigns with a conversion objective. Update the heatmap colors of each column to the color of your choice. Add a border shadow for appearance. Create a stacked bar chart to show results by age and gender information. Use this chart to understand the ages and gender driving the most results from your campaigns. This chart comes in handy when reporting on high-value actions like leads and purchases to determine where to allocate your Facebook ads budget. Analyze platform and placement results with a horizontal bar chart showing results and cost per result for each. If you’re currently using automatic placements for your campaigns across Facebook, Instagram, Audience Network, Messenger, and Stories, these types of charts show where you’re driving results and at what cost. Use Publisher Platform as the dimension when you want to see the performance between Facebook, Instagram, Audience Network, and Messenger. Use Placement as the dimension when you want to dive deeper into which placements within each platform are driving results and at what cost. 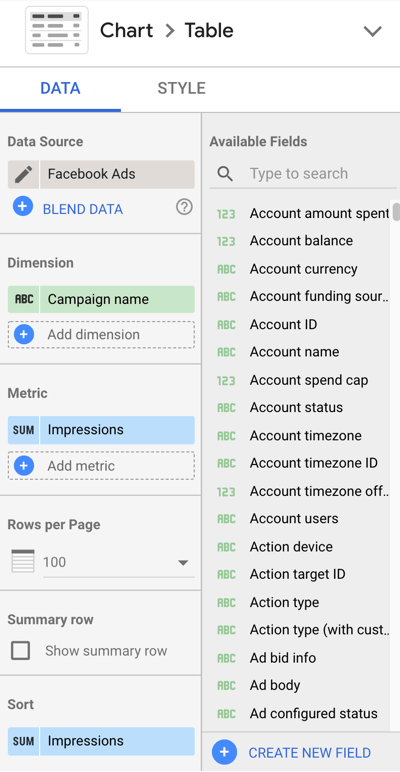 Create filters to narrow your data to show only campaigns with the same objective to get a more accurate picture of results for those campaigns. Do you have questions like, “How do I know if I’m making long-term progress with my optimizations?” If you do, you’ll love this chart. Create a bar chart to show results per month (or day, week, etc.) over an extended period. Use this type of chart to analyze performance over a quarter, month, or year depending on what type of data you want to see. 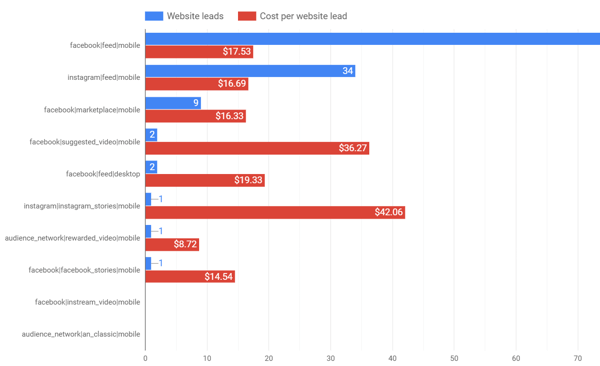 With this chart, you’ll want to see how your results trend in comparison to your cost per result. In the chart above, leads increased over time and cost per lead showed significant improvement from December to January compared to September through November. When analyzing this data, keep in mind the effect that overall ad spend will have on your total number of results. 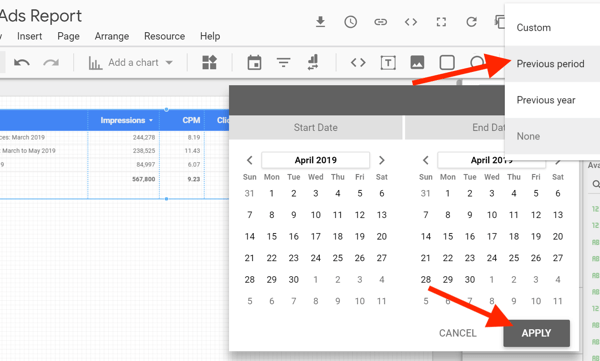 Build a chart from Google Analytics data to display your campaign traffic and engagement metrics with your site including average session duration and average time on page. Evaluate the quality of traffic coming from your campaigns. 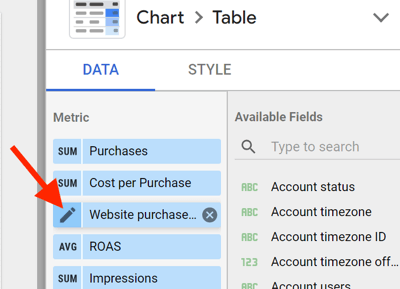 To add the Google Analytics data source to your report, select Table With Bars from the Add a Chart menu. Click on the Facebook Ads data source and search for the Google Analytics Data data source for your website. 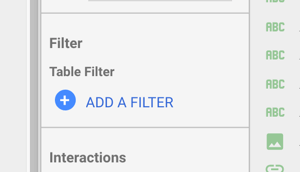 Instead of creating a segment in Google Analytics, you can also create a filter within Data Studio to include only Facebook campaign traffic. 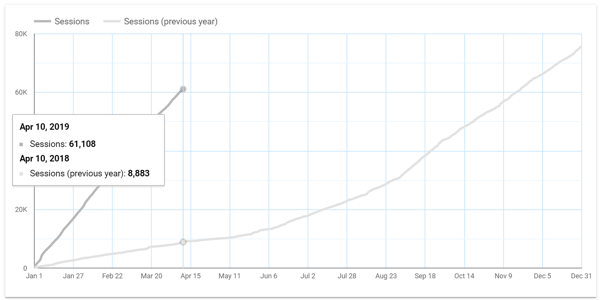 Show big-picture data with year-over-year comparison charts. Determine how you’re pacing throughout the year in comparison to data from last year’s Facebook advertising efforts with a chart that shows cumulative data for the current year compared to the previous year. This chart works well with Facebook Ads data and Google Analytics data. 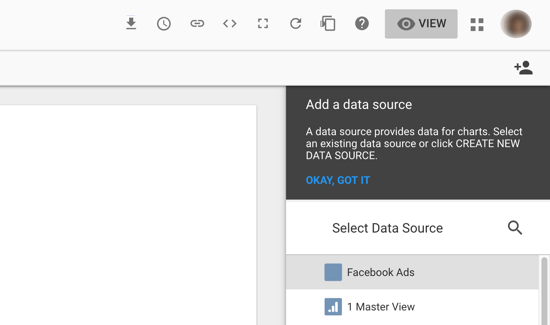 This article provides several ways to integrate your Facebook Ads Manager and Google Analytics data into Google Data Studio for better reporting and analysis. Use these recommendations, along with other customizations, to make the most of Data Studio and improve your Facebook advertising. What do you think? Which charts have you created to gain more insight into your Facebook ad campaign performance? Which of these charts will you integrate into your Data Studio dashboards? Share your ideas in the comments below.